Like most people with a social media account, I’ve been exposed to a lot of Marie Kondo over the last couple of weeks. Since a high proportion of my online friends are either writers or avid readers, a lot of that reaction has been on the negative-to-downright-enraged side, due to the rumour that Kondo will only let you keep your 30 favourite books. So I started watching her Netflix show to see what all the fuss was about. Much of the fuss, I have discovered, is the sneaky sense of superiority that comes from seeing how much tidier and less burdened by avalanches of possessions my house is. This is the same sense of satisfaction I suspect people get from watching Hoarders (a show I have no experience of, but have likewise heard a lot about). I still have a couple of episodes left to go, but the essence of the thing seems to be just taking the time to look at what you own. While that is valuable in and of itself, there are some things I’ve learned on my own, self-directed, tidying adventures that have not yet been mentioned on the show, and I thought I’d share them here, in case they help you, too! Moving in: the original tidying challenge. Tidying is an iterative process. Going through your mountain of clothes once isn’t going to do it, because there are only so many things we are willing to part with in one shot. This was driven home to me the last time we moved. 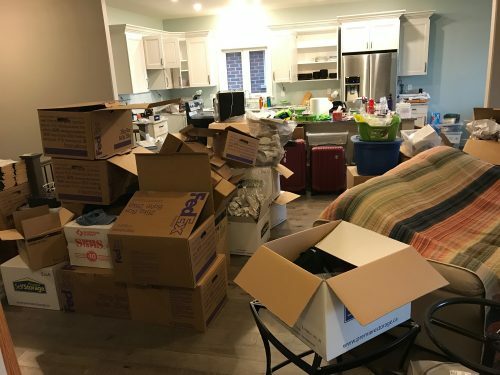 We knew that our new house was smaller than our old, and we didn’t want to pay to haul stuff across the country that we’d never use again, so we got rid of a ton of things before we left. Only to be confronted by our possessions all over again as we realized just how much smaller our new house actually was. The tidying, it gets done over and over. The sentimental items, in particular, are iterative. My mother passed almost 10 years ago and I’m still asking myself whether I’ve kept things of hers because I really like them, or whether I’ve kept them just because they were hers. Recognizing that I don’t actually need physical objects to remind me to think of her has made it a lot easier to let things go. It’s a lot easier to get rid of things if you know that someone else is going to be able to use and enjoy them – that they won’t be wasted. That’s why we have a charity donation box on the go all the time. When we find something useable that it’s time to part with, it goes in the box. It’s really important to be aware of the difference between the kind of person you’d like to think you are, and the kind of person you actually are. Case in point: the Christmas before Tech Support and I got married, we had both of our families over for dinner and ended up serving the gravy in a four-cup liquid measuring cup. So we put gravy boats on our wedding registry. Guess how many times we’ve used them in the 10 years since? NEVER. Because we are hermits and we don’t do dinner parties. When we do have people over, we let them serve themselves from the cooking dishes because why do more dishes than you have to? Don’t buy stuff you don’t actually need. Western consumer culture makes that difficult, to be sure. But one thing I’ve learned as I’ve gotten older is that experiences and quality time spark way more joy than stuff could ever do. And having less stuff makes you appreciate the stuff you do have a whole lot more – more signal, less noise. What about you? Are you a fan of Kondo? What tidying tips have made the most difference for you? Your tips are bang on. Especially like the who you think you should be and who you really are). I do like her, have been a fan for a few years now. I like the pile of items idea, because I think we don’t really “see” the excessive amounts of things we have while we have it spread all over the house. I think it helps to shock us into reality. I think our things weigh us down and prevent us from living a fuller life. I do like the pile method – I haven’t tried that but yes, it was totally shocking to watch some of the people on the show confronted by the mounds of things. When everything is tucked away, the scale of the situation is a lot harder to appreciate. Here’s to ditching the gravy boat!